Enolsoft PDF-Compress app helps you to easily shrink and reduce the size of large PDF documents. * Shrink PDF file size on Mac with ease and quickly. 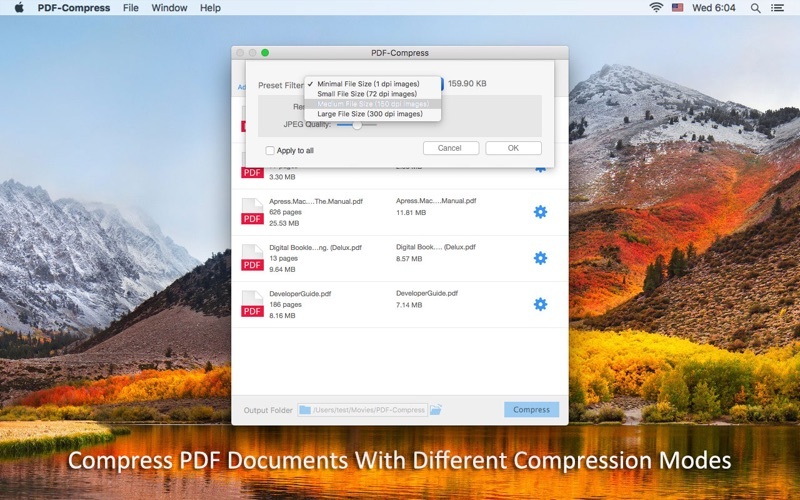 * Compress password protected PDF files on Mac. * Support drag-n-drop to batch compress multiple PDFs instantly at a time. * Four preset filter modes available to help you compress PDF quickly. * Allows customize PDF size via set resolution and JPEG quality for your preferred compression result and content quality. * Shows the sizes of your PDF files and the predicted sizes when select different compression modes in real-time. * Fast PDF Compressing speed: Compress a 500-page PDF file within 1 minute. * Compress your PDF file's size up to 90% compare to original file size. * Compress PDF for email attachment, for posting on the Web or reading on portable device. * Well compatible with macOS High Sierra 10.13. To Compress open password encrypted PDF, you need to type the open password before starting compression. Copyright: © 2011-2018 Enolsoft Co., Ltd. All Rights Reserved.